Alfa Web Review 2019: Is Alfa Web a Good Hosting? Alfa Web is a no-frills provider of affordable hosting packages that are light on features but easy-to-customize at the checkout. Romanian web host Alfa Web has been providing services since 2005. This company sells I.T. and website development services in addition to the usual hosting services. Their simple website is available in English and Romanian, and their servers are located in the company’s own data center in Romania. The shared hosting plans use robust dual-core Intel Xeon Processors with RAID1 HDD (which is quite unusual now that many web hosts are standardizing on SSD storage). They come with the CentOS flavor of Linux and the easy-to-use cPanel control panel. Alfa Web owns and operates its own Romanian data center, which should mean faster response times to technical issues and less chance of resources being oversold. It’s also a bonus for Romanian businesses to host their websites close to their Romanian customers. Whilst I am impressed with the data center and the infrastructure (HDD aside), the plans provide limited additional value in terms of features. There is support for multiple FTP accounts and for PHP (up to version 5.4.x). However, there is no SSH access, no support for advanced coding languages, and no website building tool. Alfa Web offers seven shared hosting plans ranging from the free Alfa plan (with only 200MB disk space) to an overpriced unlimited package. Somewhere in the middle are the Beta and Gamma plans with 1500MB and 4000MB disk space respectively. The catch is that you have to invest in one of the much higher priced Sigma or Omega plans if you want more than five domains. Domains names cost extra with all but the most expensive plan. It’s a little confusing that some packages can be bought on one and two-year terms whereas others also offer three and six-month terms. As a rule of thumb, the cheaper plans require longer-term commitments. There are lots of ways to customize your plan by adding or reducing resources such as disk space, traffic, and dedicated IP. So you can build a plan that perfectly meets your needs. You can upgrade at any time, and downgrade at the end of your billing cycle. 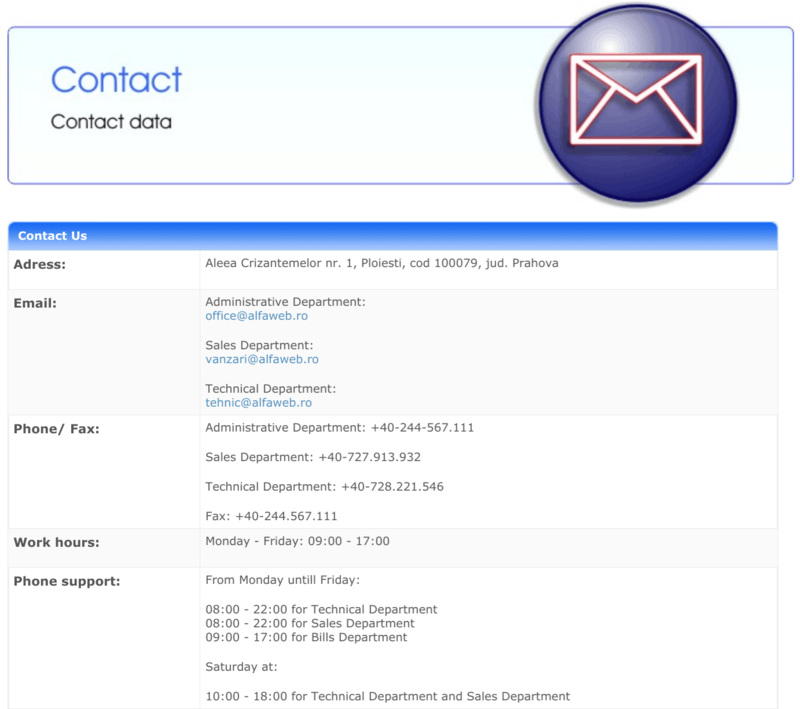 Although support is only by telephone, email, and fax, I do like the clarity of the contact page that provides different email addresses for different departments (admin, sales, and tech support), along with clear business hours. Though this is not 24/7 support, you can contact the technical team up to 10.00pm on weekdays and up to 6.00pm on Saturdays. Alfa Web provides mainly Romanian customers with customizable web hosting packages hosted at their own data center. The affordable plans don’t provide a plethora of features but do give you the opportunity to pick and mix resources to meet your needs. 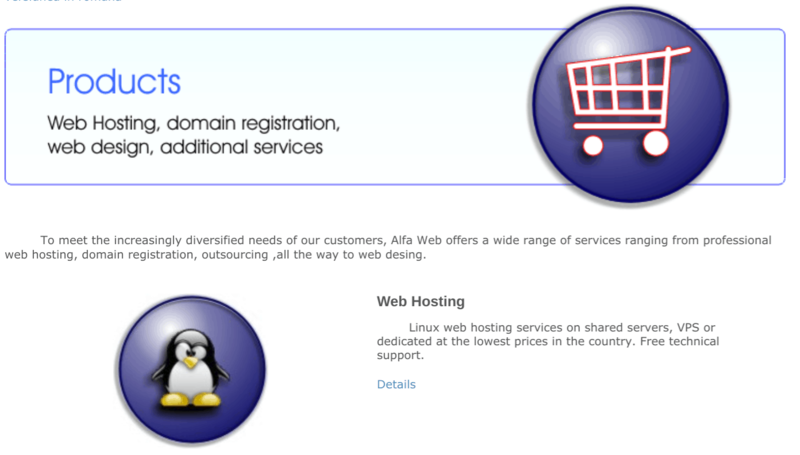 Wondering how Alfa Web stacks up against other Web Hosting companies? Enter any other Web Hosting company and we will give you a side-by-side comparison.